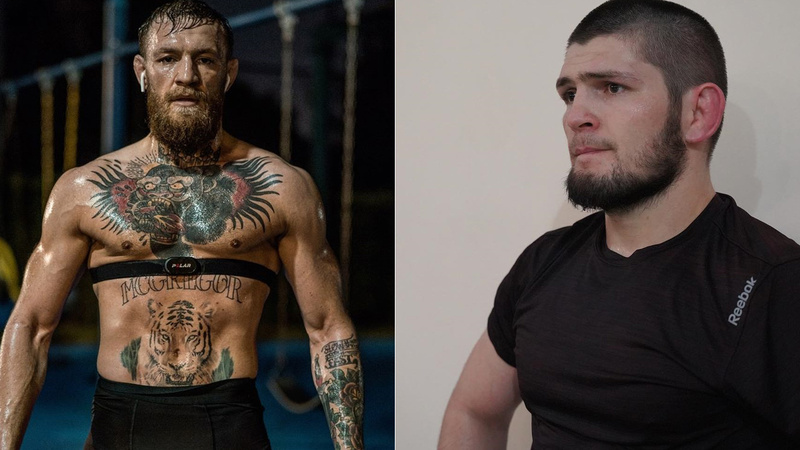 Conor Mcgregor continues to fires shot at Khabib Nurmagomedov. Last week both rivals got into a personal Twitter war. It seems a fire inside Mcgregor is still sulking since he suffered a fourth-round submission loss to Khabib Nurmagomedov at UFC 229 last October. This rage can be settled inside the Octagon, although he doesn’t deserve a rematch. 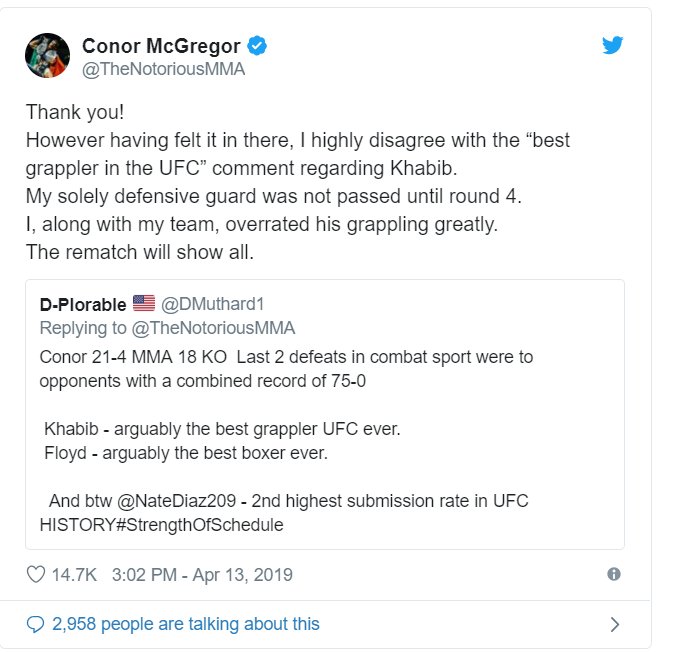 Earlier today he threw shade at Khabib in an indirect way when a fan praised his MMA record and analyzed his losses to that Irishman thanked him. However, at one point, Mcgregor ‘highly disagree’ with the ‘best grappler in the UFC’ comment. Conor Mcgregor’s longtime SGB coach John Kavanagh also expressed his disappointment at UFC 229 loss and have claimed to have taken a lot of lessons from the defeat. Khabib’s grappling and wrestling pedigree were a huge concern for Conor’s team, and it happened in the fight Mcgregor was destroyed and taken down. At last Irishman forced to tap out in the fourth round via neck crank. McGregor’s MMA losses have come by way of submission, while Khabib’s 27 victories have come as a result of foe’s tapping out. However, Mcgregor can prove his doubters wrong if they ever meet inside the Octagon again. 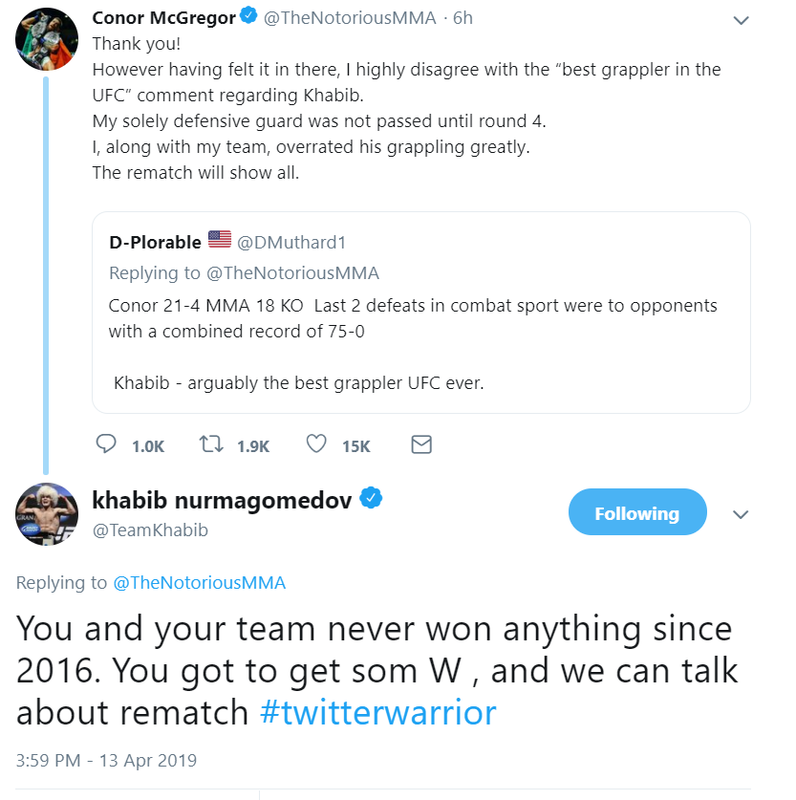 Khabib Nurmagomedov acknowledges Conor’s comment and fires back with his own. It’s expected Khabib Nurmagomedov to take on the winner of tonight’s UFC 236 main event winner between Max Holloway and Dustin Poirier. So it clearly shows Khabib is currently the best grappler in the UFC. Do you agree with this claim?